Nice looking char. I pack my barrel as full and as tight as I can get it. I have used two different kinds of afterburners on my retorts but still have more smoke than I like. I hope you come up with a good design that I can copy. This thing produces a lot of smoke and will need a pretty big/aggressive way to burn it off. Maybe some other readers will submit ideas? Nice one Carl , nice compact setup are you going to raise it up off the ground and onto a stand ? I am also playing with my charcoal making retorts , i have a cone for all my small twigs/branches with leaves on and a insulated 55 gallon drum like yours except mine stands up with a 4 inch pipe going from the middle of the bottom up towards the lid and then a 90 deg just below the lid and out the side , that allows me to pack it without getting the lid off center and sealing problems , the drum then sits on top of a fire pit and i feed into it gum leaves , the oils from those leaves roar like i was using diesel to char it ., you can just see the black oily smoke coming from the cone , but nothing coming out of the insulated drum , even though i was charing green wood and had not extended the chimney at that point . Hey Dave, the retort is sitting on a tiny stand, which I wanted to keep low to make it easier to do something with the flue gasses. I want to eventually site this thing on a hillside, and then build some sort of drying barrel that gets blasted with all the waste heat from the afterburner. I ran another batch today, and it was modestly successful. I put in maybe 20-25% more wood, and used more wood to get it going. I suspect that the moisture was higher on this batch, as I used some old firewood that had been sitting out under sheet metal. It took maybe 2.5 hours to get smoke that was dry enough to light. I managed to contain the leaks around the chimney, and the larger steam vent prevented the fire from being choked, but the leaks around the lid are still a persistent problem. Here is a video of it once it starts burning off gas. Route the smoke from the steam vent into the chimney to try and flare it. 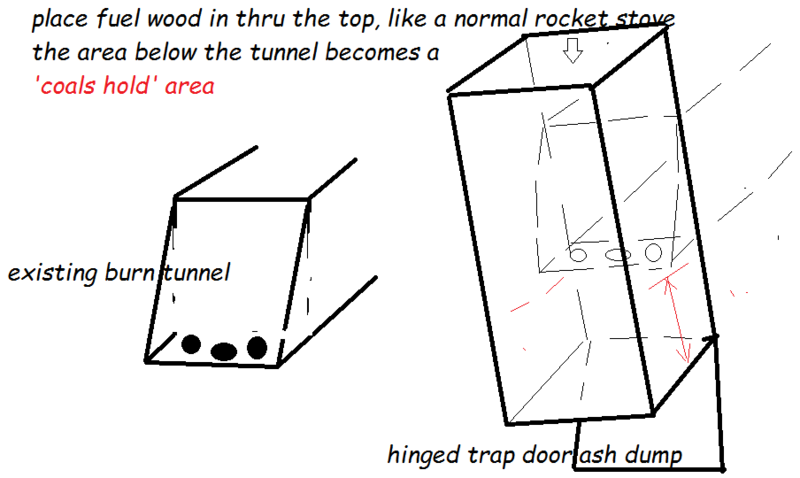 Build a finned tube to put on the steam vent that condenses out steam, and allows it to drain out through a trap. Make some sort of removeable shroud around the lid that can be filled with ashes to prevent leaks. While this horizontal method is easy to empty, I wonder if that is outweighed by the difficulty in achieving a proper seal. The smoke is not really a problem in and of itself, but since the retort needs to be tended pretty regularly, it gets rather irritating. I welcome any input, but I am considering maybe experimenting with a vertical setup more akin to the original Hookway retort. Hi Carl ,if you need to use the flare from the chimney to dry the next batch or some other things then the way you have it might be the best as its so low to the ground , i think as long as you have a gasket of some type , ( i use stove rope about 6mm dia ) around the lip of the lid and then use some self tapper screws around it to force a good seal on to the drum then you should be ok , the other thing you could try is to help lower the pressure inside the drum by grinding some slots in your feed tube and that will allow more of the gasses , and of course more steam out of the drum and up into the chimney , that is what i did and seems to work fine for me . Keep at it and you will get it tuned in. I’m not sure why my setup is self-generating at 20-30 minutes and yours takes 5X as long. My opinion is that you need to get the temperature way up in your fire tube. I would use smaller pieces of wood with an expanded metal grate so that there is plenty of air blasting up through the entire length of your kindling fire. Use a strong blower to give as much turbulent air as the wood will take to create a violent blast furnace in your tube which should be glowing red hot. Hey Dave, I think this might be the ticket - what I am leaning towards is adding a smoke-catcher over the steam vent - maybe using some 4" ducting or the like. By giving the steam/smoke a way to be sucked into the main chimney, I can regulate the pressure by just cracking my steam vent. The smoke goes up the chimney, and hopefully burns off (if not it will at least be sent skywards instead of billowing around in my work area). My opinion is that you need to get the temperature way up in your fire tube. I think you are onto something with this: I fired the first burn a lot harder and got smoke much faster. The problem came when all the steam tried to share the firebox with a bunch of half-burnt wood. If I can dial in the control over the smoke I think I should be able to fire it hard at the outset, then scrape out enough space to let it start burning its own gasses once it gets up to heat. I will make some more modifications before the next test. And interesting video, btw. Looks like a much more elaborate version of my original concept. Heat transfer is fast - but I am not sure I would call it efficient. I generally had to burn as much wood as went into the barrel in order to get it flaring. The high heat also meant that the barrel would start to melt and sag. The concept has promise, but requires further development. Haven’t seen this one before. Looks promising. I like it And other than not using the heat but it seems most don’t. This is wery similar to what l am planing to build once the wood boiler we use now will need replacement. Its already about 25 years old and is nearing its end. Runs every day all year long and burns about 5 cords a year. Take all this butyfull flame and “waste” to heat the house while produce engine fuel is my car wuld be a perfect sistem for me. The lack of smoke coming from the wood when you look through the flames means that wood has a very low moisture content. Secondary air is added at the bottom of the blue shroud and meets the hot gasses coming off the wood allowing it to burn. There must be some combustion air that enters the area where the charcoal is augured out, travels down the pipe and up through the deep bed of charcoal to where the wood is burning. I am not sure why the charcoal does not burn down to the bottom??? fire moves toward the oxygen source. It looks like a system that needs constant attention. Like every 15 minutes. I like the auger removal. Not sure what the shut down procedure is. Is the shroud removed and a cap placed on the inner container? In the written description under the video, ( when watched on youtube) as i understand it, there is a set of holes somewhere a foot or so down in the inner drum, for primary air supply. So since air take path of least resistance…So, not unlike our gasifiers, the most heat is at the nozzles and the char falls down to fill the bottom and cools once below the air inlets. He hoses it down with water to shut down. .Design details: It is made out of a roughly 40 gallon propane turned vertical with the top cut off and a 60 gallon pressure tank with top and bottom cut off. The pressure tank is placed over the propane tank to act as a heat shroud. Air is drawn by convection from the bottom between the two tanks and travels toward the top. 9-10 inches from the top of the inner tank there is a series of 1" holes allowing some of the air into the inner tank under the wood, thus burning the wood. The rest of the air is allowed to escape out the top between the two tanks, thus supplying the secondary air to burn off the smoke. The coals that form fill the center tank and are gradually lowered down as the charcoal on the bottom is augered out. As the coals are lowered they drop below the holes where the air is introduced. Thus, deprived of O2, they too cool off by the time they are augered out of the bottom of the center tank. It looks like you have to fill it first with charcoal to start it up, then put wood on top of the charcoal. Just like starting up a Gasifier for the first time. Thanks Andy, I did not look below the video for a description. Glad you noticed it and posted. That system will surely work. But as noted, you have to fill it with charcoal to get it started. Not a bad design, just needs constant feeding. I really like the idea to use the heat from the charcoal making process for something useful, e.g. space or water heating. A good example is Gary Gilmore’s Keystone stove. A very good combination would be be a combination of the retort shown in post #147 and something like the keystone stove. I did another test on my horizontal retort the other day - after adding a section of ducting to try and capture the steam/smoke produced at startup. Here is a video of it as it is starting to produce smoke. I still had a difficult time getting it up to speed in a reasonable amount of time: It was venting smoke within half an hour, but it took over 2 hours from lighting it to get flammable gas coming out of the vent and lower jet. I got new batteries for my luggage scale and got pretty exact values for how much wood I used. 120.5# went into the drum, and 22.25# were needed to stoke the fire. I got 28.5# of really dense and nice charcoal, which accounting for moisture, gives me a conversion of about 24%. My conclusion at this point is that this style of retort is not well suited to using only a passive draft. The small cross section of the firebox means that once the wood burns down into coals, you block the airflow so much that the heat transfer into the drum slows to a crawl. I am going to have to try it again with some sort of blower fan and see if I can get the start-up burn time down under an hour. The smoke catcher works fairly well, and it is possible to adjust the pressure inside the drum a little bit by covering only part of the steam valve. Some smoke still leaks around the lid. I am going to work on the fan, but also try out a much simpler design such as the TLUD with a passive draft and afterburner. I will record some weight data for that method and see what I come up with. watching your video it came to my mind that if you would attach your rectangular flue directly and sealed to you chimney, you should get a much better draft. Maybe you don’t need a fan in this case. I have experienced things like this with a test run of an old oven. Different burning behaviour with and without a airtight connected chimney. I’ll just throw in my 2 cents worth from my ‘gasifier wannabe armchair’. Try a ‘coals hold’ type thing, that will keep a good amount of your ash, coals, and fuel out of the burn tunnel. I believe this little box could be made of the same square tubing your already using, you could even throw in a grate at some point when it suits ya. Maybe my picture will make it somewhat clear what a ‘coals hold’ might look like. Hey Oliver, This was another idea I had kicked around as a possible solution, and I think it could work. The biggest complication is how it mounts to the existing burn tunnel without getting in the way of removing the barrel lid. It almost has to just slip on and off, or else it could be bolted onto the lid itself somehow. I do like that in theory this should allow me to stick with a passive airflow, which is a big plus for me, as there is no electrical outlet within about 400 feet. Also, I suspect it might allow me to burn slightly bigger wood, and not have to babysit the retort as much. I am inspired, I think I will add this to my list of things to work on. Once I am done with this retort it is going to look like an oil refinery with all the chimneys and pipes and what-have-yous, but … in for a penny… Not sure when exactly i will get too it, as we are having a week of gorgeous weather, and I feel like I need to get so many little projects taken care of! I am hoping to test my upgraded micro-hydro setup tomorrow, which will be nice to cross off the to-do list.